On Saturday, April 16, join us in the Church Parlor, for the first film in the Environmental Justice Film Series presented by the Green Sanctuary Committee. “I AM” is an utterly engaging and entertaining non-fiction film that poses two practical and provocative questions: what’s wrong with our world, and what can we do to make it better? 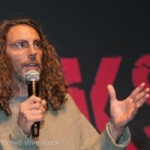 The filmmaker behind the inquiry is Tom Shadyac, one of Hollywood’s leading comedy practitioners. In “I AM”, Shadyac steps in front of the camera to recount what happened to him after a cycling accident left him incapacitated, possibly for good. Though he ultimately recovered, he emerged with a new sense of purpose, determined to share his own awakening to his prior life of excess and greed, and to investigate how he as an individual, and we as a race, could improve the way we live and walk in the world. Ironically, in the process of trying to figure out what’s wrong with the world, Shadyac discovered there’s more right than he ever imagined. Shadyac is an engaging and persuasive guide as we experience the remarkable journey that is “I AM”. With great wit, warmth, curiosity, and masterful storytelling skills, he reveals what science now tells us is one of the principal truths of the universe, a message that is as simple as it is significant: We are all connected – connected to each other and to everything around us.